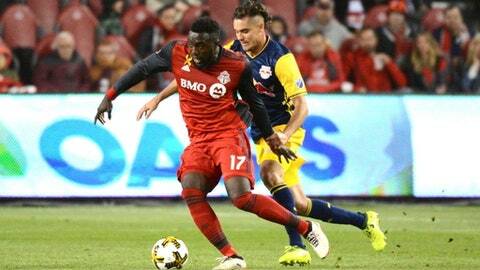 TORONTO (AP) — Victor Vazquez broke a tie in the 80th minute on a penalty kick and Toronto FC became the first Canadian team to win the Supporters’ Shield as the MLS regular-season champion, beating the New York Red Bulls 4-2 on Saturday night. Toronto players mobbed goalkeeper Alex Bono when the final whistle blew, marking TFC’s official rise from league doormat to the MLS’s best. They then posed for a photo in front of the south stand fans. Toronto (19-5-8) has assured itself of home-field advantage throughout the playoffs, including the MLS Cup final if it gets back there. The Supporters Shield also means $130,000 will be deposited in the Toronto players’ bonus pool. New York’s Daniel Royer tied it at 2 with a 77th-minute penalty after defender Drew Moor scythed down New York striker Gonzalo Veron in the box. But referee Allen Chapman pointed to the spot again minutes later when Aaron Long was caught all over Jozy Altidore in the box.